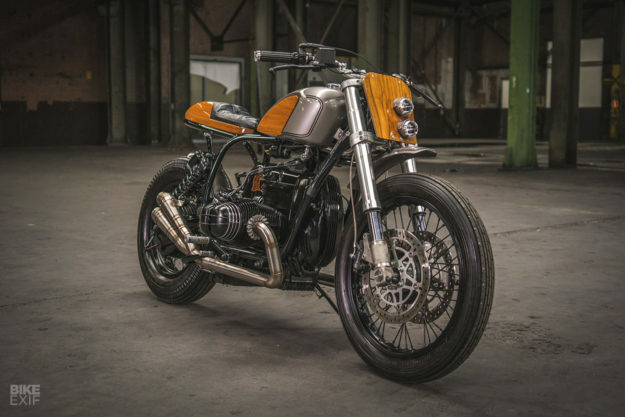 There’s a trend that’s picked up speed amazingly fast this year: wood on motorcycles. It’s tricky to pull off, but when it’s executed tastefully the results can be spectacular. After all, some of the world’s most desirable cars and yachts feature exquisite wooden highlights. 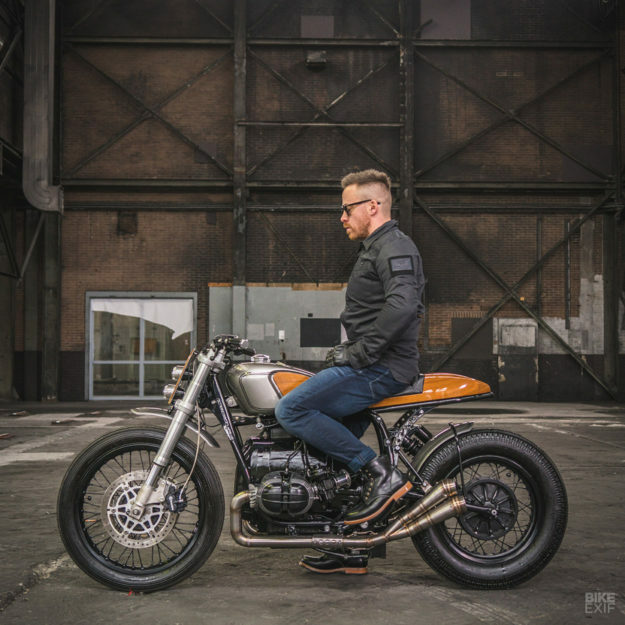 And that’s where Arjan van den Boom of Ironwood Motorcycles found inspiration for his latest build—cars such as Aston Martins, and classic Riva boats. Though the wooden motif dominates the aesthetic, there’s actually a lot more going on here—like a completely re-worked rear end. 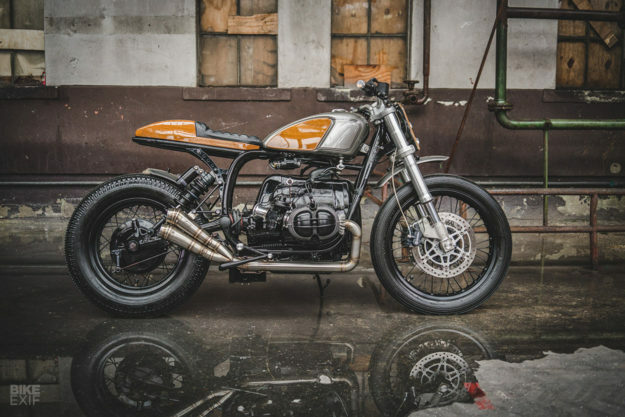 Gone is the BMW’s original twin shock setup: in its place, Arjan has fabricated a new subframe, and modified the swing arm to run a single shock. The blacked-out rear shock is a fully custom unit from Hyperpro. Up front, Arjan swapped the forks out for a set of upside-downs off a Ducati S2R. The upgrade package also included the Duc’s Brembo brake discs, calipers and master cylinder. Stainless steel braided brake hoses were fitted up front too. The wheels are also new, with a 19” rim out front and a 16” rim out back, both laced up to the original hubs. Arjan opted for classic treads: an Avon Speedmaster in the front, and a fat 5” wide Shinko at the rear. That’s a hefty tire for an old airhead, so the swing arm had to be fettled a little to squeeze it in. 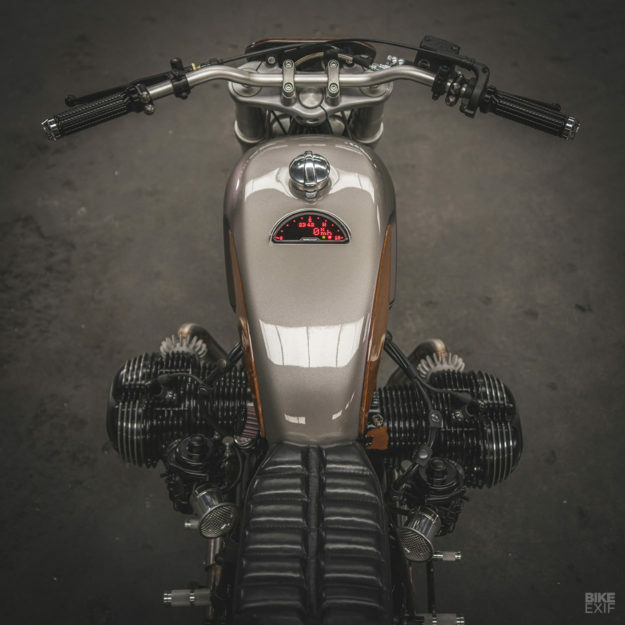 Sitting up top is an aftermarket tank, originally designed for a Harley-Davidson Sportster Forty-Eight. It’s been modded to fit the BMW and run two petcocks, and it now wears a Monza-style gas cap. It also houses a Motogadget dash, up top. Then there are those wooden kneepads—matched up to a wooden headlight plate and tail section. 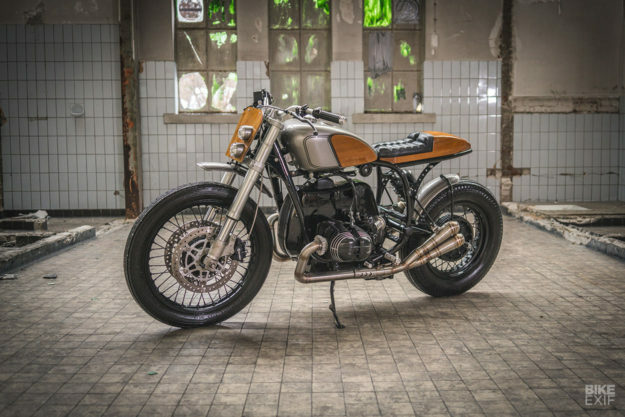 Arjan called on Marcel van der Stelt at The Custom Factory to execute the wooden bits. And if the seat seems overly chunky, that was deliberate; “the upholstery was inspired by Côte d’Or chocolate chunks,” says Arjan. Rounding out the bodywork is a pair of abbreviated fenders—held in place by hand-made braces. The stainless steel exhaust headers are custom too, terminating two pairs of Lazer mufflers. The engine’s wearing a shiny new black coat, but the refresh was more than just skin deep. Arjan cracked it open and took a look, then buttoned it up again with new seals and a set of classic ‘peanut’ valve covers. The valves were adjusted and new rocker arms were installed. 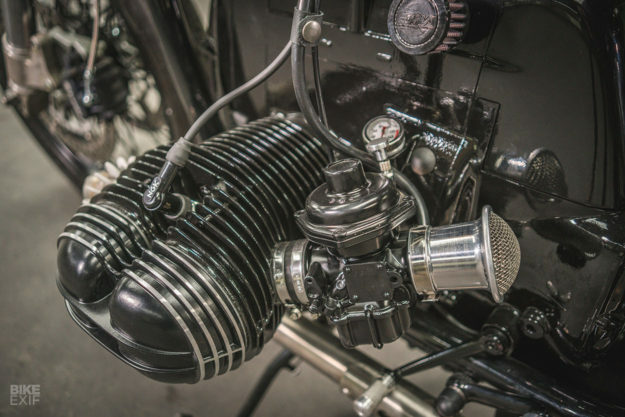 As for the carbs, those were ultrasonically cleaned, treated to new diaphragms, and adjusted with new needles to run with one-off velocity stacks. They also now feature nifty little hand-made choke pulls. There’s also an all-new wiring loom with a new diode board, coils and ignition. Everything runs off Motogadget’s new Bluetooth-enabled m.unit blue, and the battery’s been tucked away out of sight. 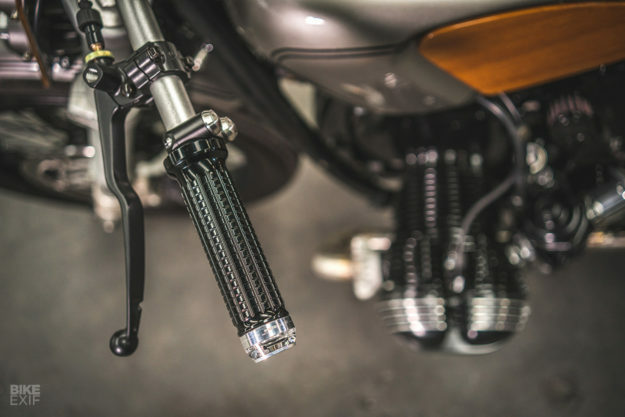 The entire lighting package is LED, including a full set of Motogadget turn signals, grips and switches. There are a few smaller details to take in too. 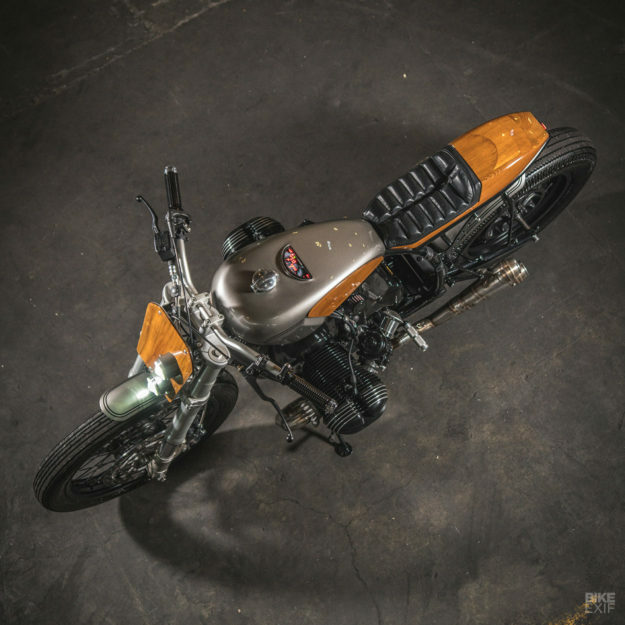 The ignition’s been relocated to the top of the engine, the footpegs are custom-machined aluminum numbers, and Arjan’s even installed an oil filler cap with a temperature gauge. The final livery is—thankfully—simple and classy, letting that stunning woodwork shine. The tank and fenders are simply finished in a Mini Countryman color called ‘Melting Silver,’ with some subtle black pin striping. Not only has Arjan displayed impeccable taste in finishes, he’s nailed the BMW’s stance too. 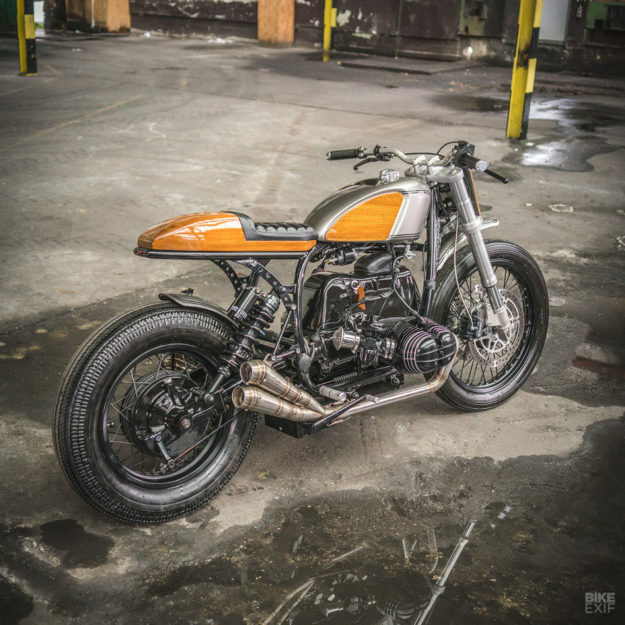 And he’s managed to mesh together just the right amounts of café and scrambler styling to create a bike that we’d love in our garage. It doesn’t hurt that Arjan’s surname ‘Boom’ is Dutch for ‘tree’ either. With thanks to: Powdercoating by Custom Coatings Helvoirt, rear shock set up by Hyperpro, bodywork in collaboration with Marcel v/d Stelt from The Custom Factory.